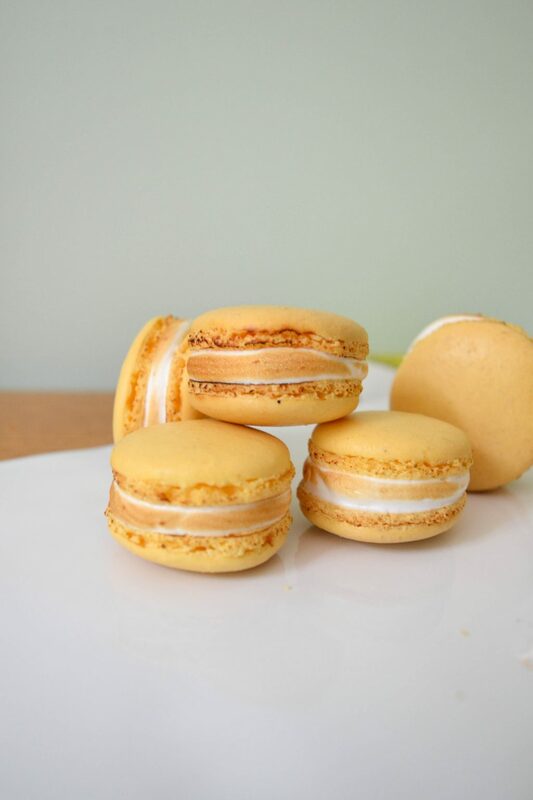 We can’t resist making macarons, so when we combined our favourite patisserie with tart lemon curd and brûléed meringue we just had to share it with you! 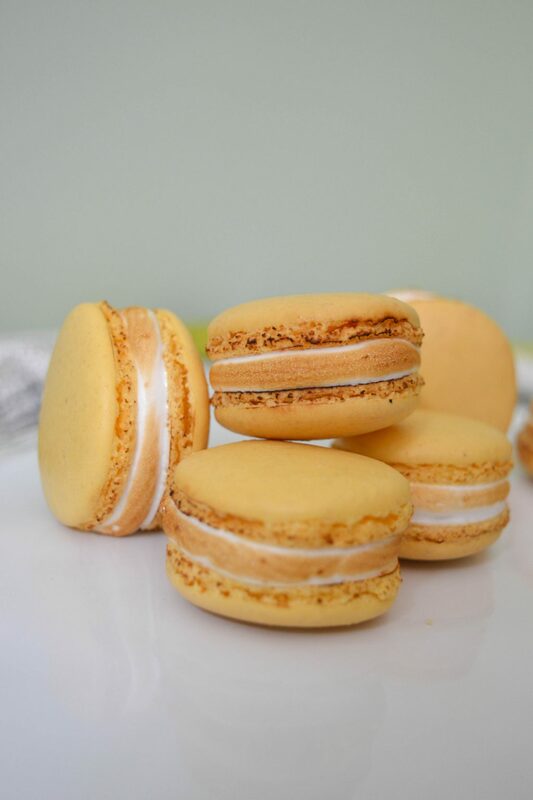 These beauties were made to decorate a lemon meringue pie cake, but they are star of the show all on their own. 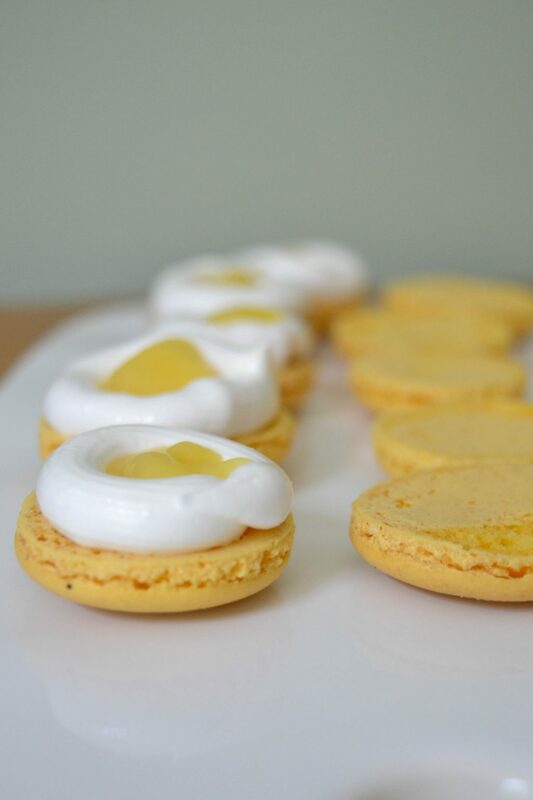 The lemon curd centre really helps to cut through the sweet and sticky deliciousness of the meringue, which is what makes both these and the classic lemon meringue pie such a winner. 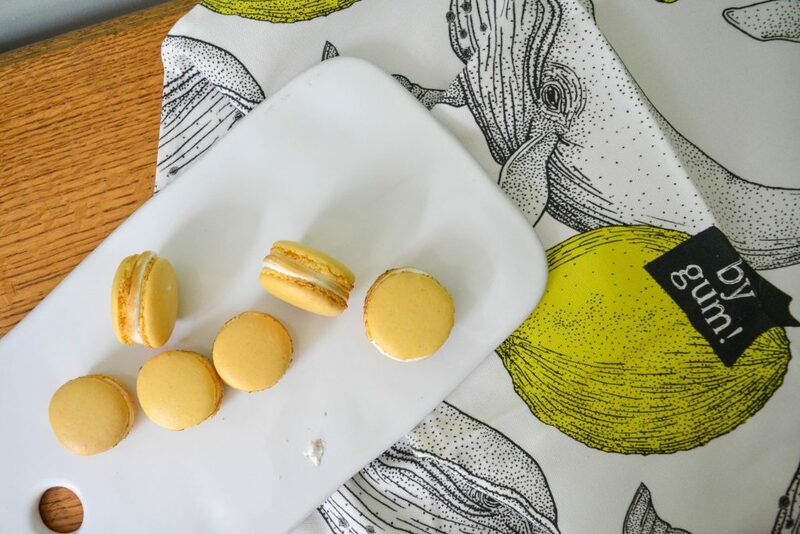 These gorgeous macarons also were perfect for sitting on top of this amazing tea towel from Pig & Fig! They’re an awesome British company who make all their products here in the UK, you’ll be seeing more of their products creeping into our shots as they so kindly sent us some bits and pieces for our very own. Go grab yourself an apron guys (pheasants and scotch eggs… need we say more?!) We’re also thinking they’ll be great for Christmas presents… yes we did just say the C word! 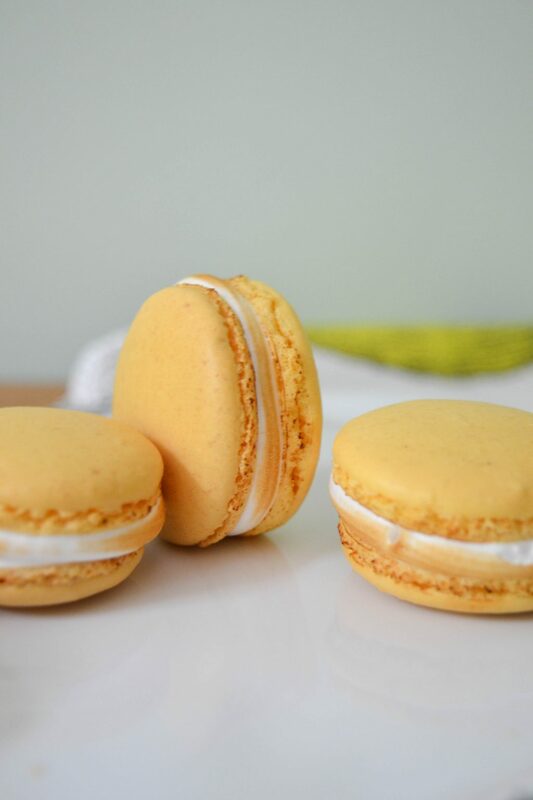 For these beauties we made a homemade lemon curd, but any you have to hand will do, you want to make sure its a fairly firm set curd so it doesn’t spill everywhere when you bite into the macaron as the curd makes up the core of the filling with a ring of italian meringue around the edge. 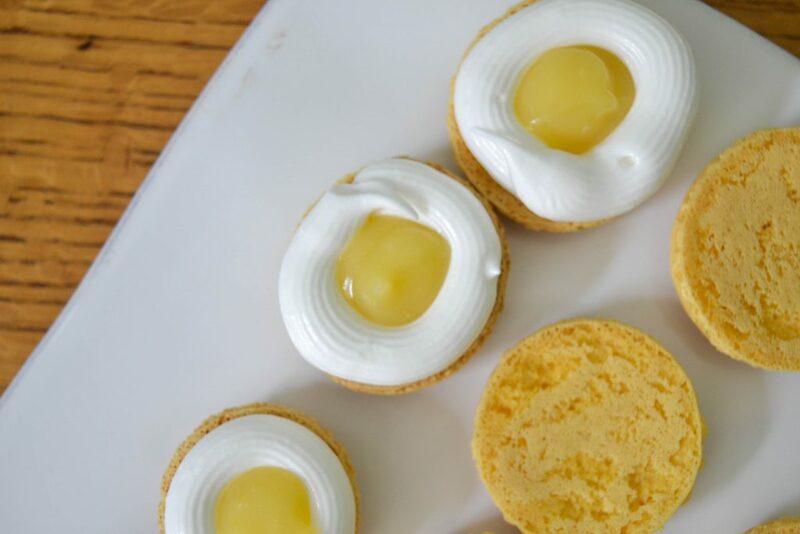 It’s important to use itlian meringue here as this method cooks the egg whites as you add the hot sugar syrup meaning it’s safe to eat without baking! 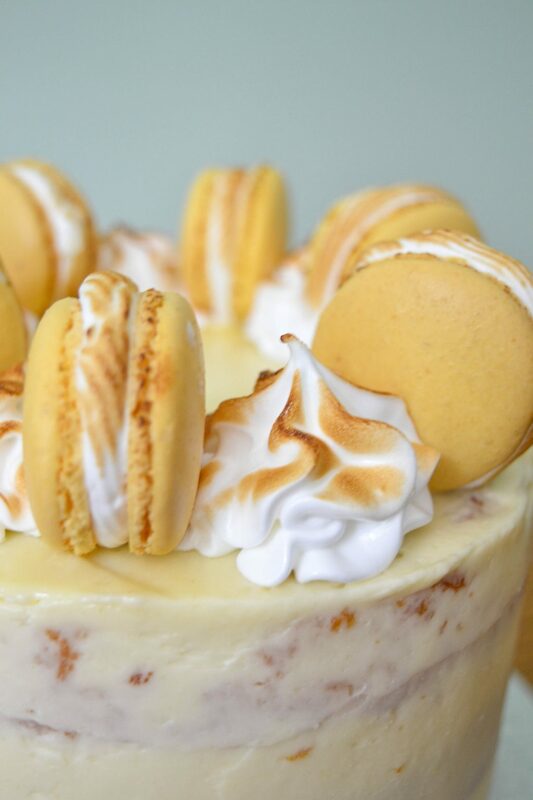 We chose to brûlée this italian meringue a little, to recreate the flavour of the browning you typically get on the meringue topping to a lemon meringue pie! Process the icing sugar and the almonds together in a food processor, then sift into a bowl. Place the water and caster sugar in a pan and bring to a boil, making a syrup, monitoring the temperature as you do so. Beat 40g of the egg whites to form soft peaks, as the temperature of the syrup passes 105C increase the speed of the beater. When the syrup reaches 117C remove the pan from the heat and pour slowly into the egg whites in a thin stream. Then continue to beat the meringue for about 5-10 mins so it cools down. Whilst that is cooling, add the other 40g of egg whites, the vanilla extract and food colouring into the bowl with the almonds and icing sugar and mix to form a paste. Add in about a third of the meringue and incorporate into the paste to loosen the mixture, this is best done with a silicone spatula. Then add the rest of the meringue and mix in carefully. It is important to fully incorporate the meringue and not under or over mix. The mixture should be smooth, uniform and gently flowing, not too runny or with white bits of meringue running through it. 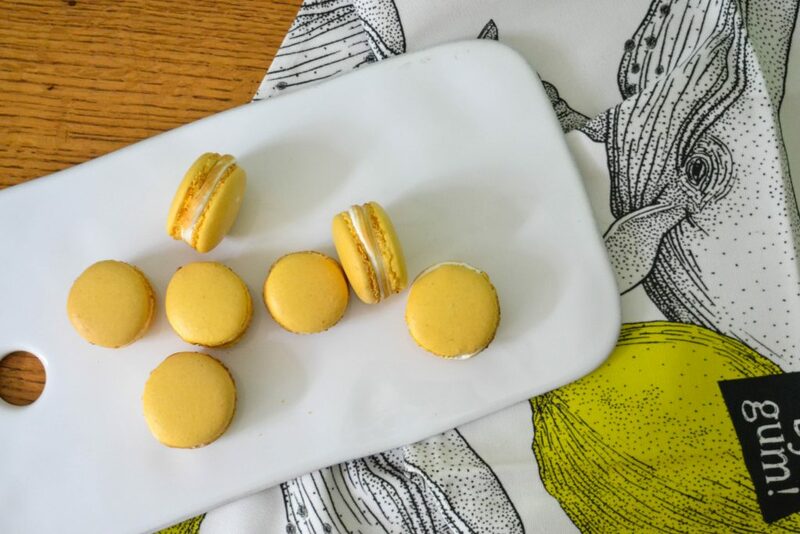 Transfer the mixture to a piping bag with an 8mm or 1cm nozzle and pipe out small, regular rounds about 3cm in diameter onto a lined baking tray or silicone sheet (you can find guides or buy silicone sheets to help you pipe the circular macarons). Tap the trays and then leave for 30mins to form a skin. Bake in the oven at 155C for 14 mins. 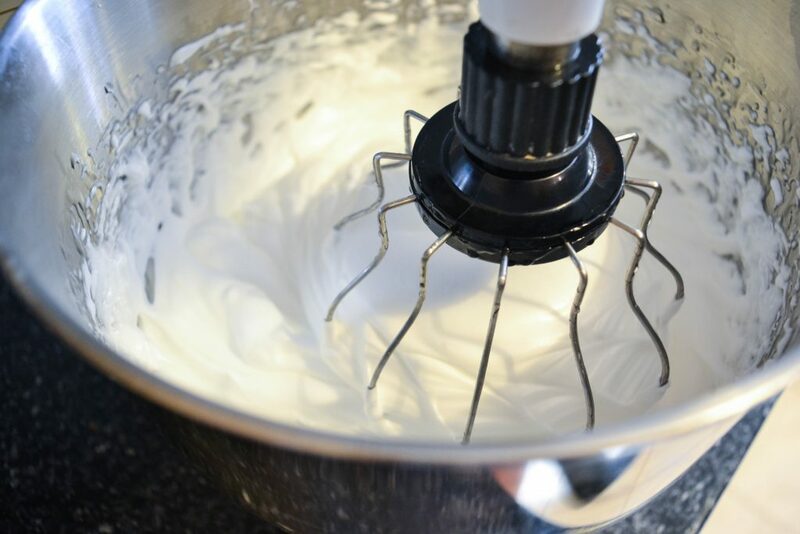 To make your italian meringue, beat the egg whites to form soft peaks, as the temperature of the syrup passes 105C increase the speed of the beater. Then continue to beat the meringue for about 5-10 mins so it cools down. 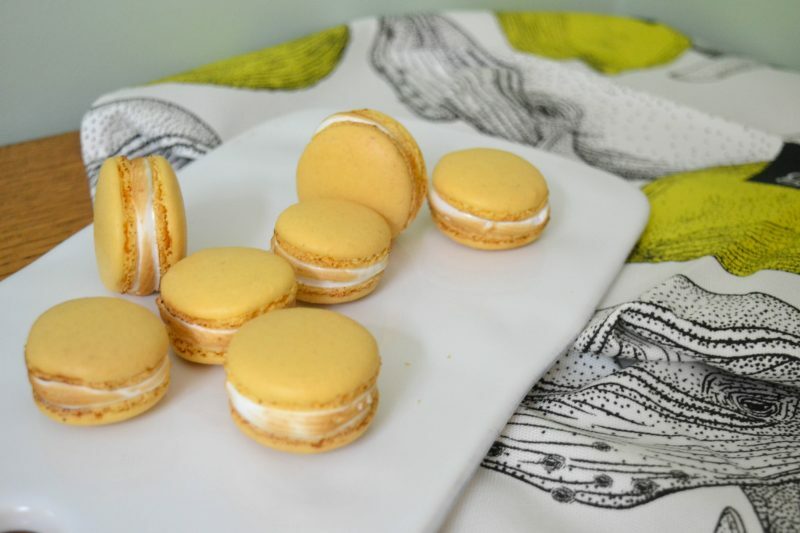 (this is the same process as the first few steps of the macaron shells). Place your italian meringue into a piping bag fitter with a open star tipped nozzle. 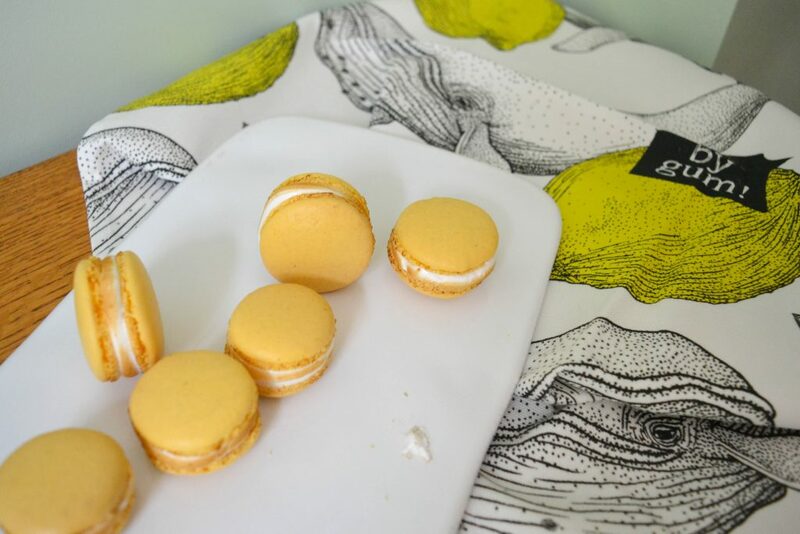 Pipe a circle around the edge of a macaron shell, fill the hole left in the middle with lemon curd and place another macaron shell on top, repeat with the rest of the shells. Optional! With a blow torch, gentley brulee the visible edges of the meringue to give them some colour.